A new Palm Beach County Supervisor of Elections is overseeing her first election since she was appointed by Gov. Ron DeSantis. PALM BEACH COUNTY, Fla.-- As voters in 16 municipalities in Palm Beach County decide the future of their cities at the polls Tuesday, a new leader at the Palm Beach County Supervisor of Elections Office is already overseeing her first official Election Day, which she said is running smoothly so far. 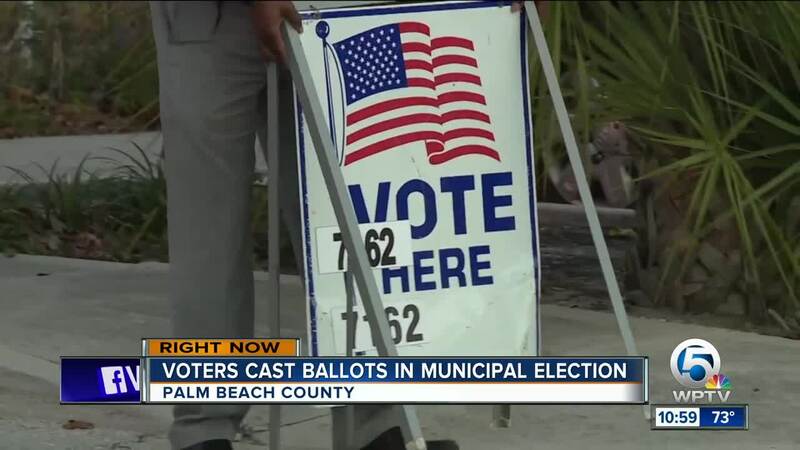 "The municipal election, it's really what affects people more in their day to day life in terms of what the policies are going to be locally, what taxes are going to be, what the budgets will be, so we're just trying to get people to get out and vote in every election," Palm Beach County Supervisor of Elections Wendy Sartory Link said. Sartory Link took over for Susan Bucher earlier this year after the governor suspended Bucher following recount issues in November. Sartory Link reports no issues at polling places around Palm Beach County in the first few hours of the municipal Election Day. While she hasn't heard about any lines, she said the busiest precincts are in Boynton Beach, West Palm Beach and Highland Beach. She planned to visit polling places first before going over to the tabulation center in Riviera Beach around 3 p.m. to start duplicating damaged ballots and opening last-minute vote by mail ballots. Once the polls close at 7 p.m. much of the work really begins for the elections office staff, especially with old machines that failed in November. But Sartory Link said those machines have been repaired and tested in recent weeks. She expects them to run smoothly Tuesday night. New tabulation machines are set to arrive at the end of April. Those will streamline the results calculation process, no longer requiring results from precincts to go to a regional center first before being sent to the tabulation center. "Once we have the new machines they should be able to be downloaded directly from the precinct so we'll skip a step and it should be a lot faster," Sartory Link said. Sartory Link expects to be at the tabulation center until about 3 a.m. Wednesday completing elections results.